We are slowly getting settled into the new casa and it is a joy to have a full kitchen again! I’ve been using the oven quite a bit to make sheet pan meals like this Chipotle Butternut Squash Panzanella Salad! 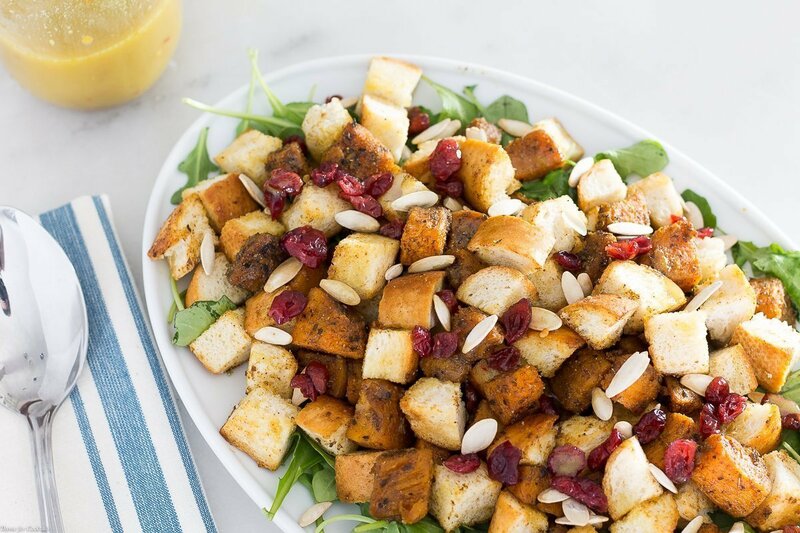 This savory bread salad is the perfect way to enjoy a seasonal dish that it still light and healthy. My eating habits have been slipping lately with the busyness of the move. It’s nice to slow down a little! I have been getting back to the farmers market and it is gourd heaven! 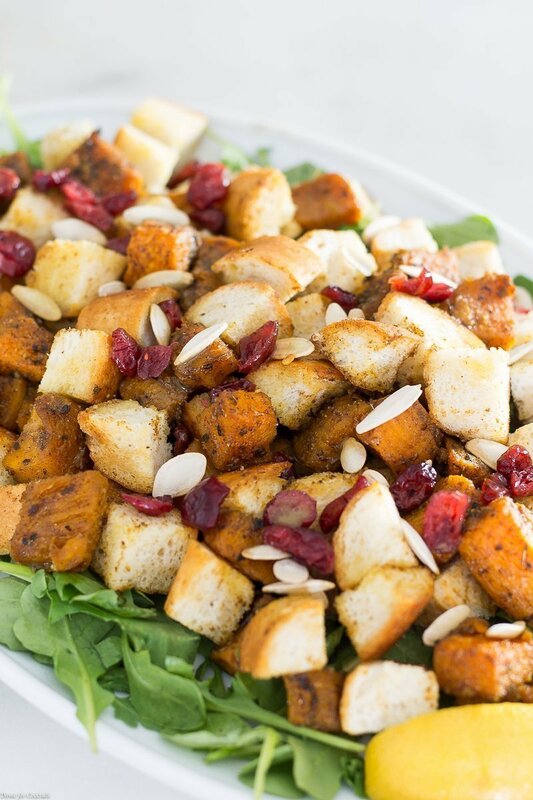 We have been eating more meatless dishes and this salad has roasted squash, toasted seasoned bread cubes, and salted pepitas. Spices like cumin, chipotle powder, and coriander pair perfectly with the squash, giving it a warm, almost southwest kick. 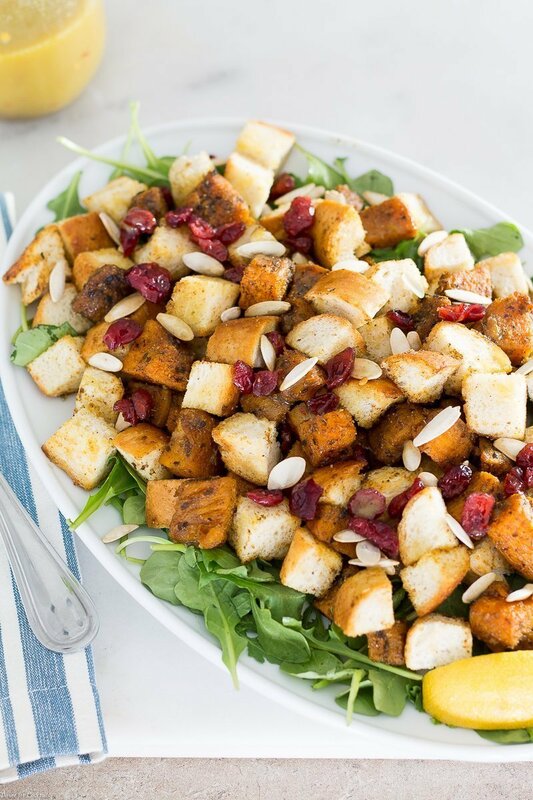 Peppery arugula give this Chipotle Butternut Squash Panzanella Salad recipe a fresh twist too. Black beans would be a great addition if you want to add a dose of protein. This salad is best serve warm, family style with your favorite white wine pairing. I used a quality Chardonnay in the Spicy Maple White Wine Vinaigrette so it makes sense it would pair well with the salad. We shared this family style recipe with friends recently since it’s perfect for Holiday Entertaining! I think the dressing would make a really delicious marinade too! 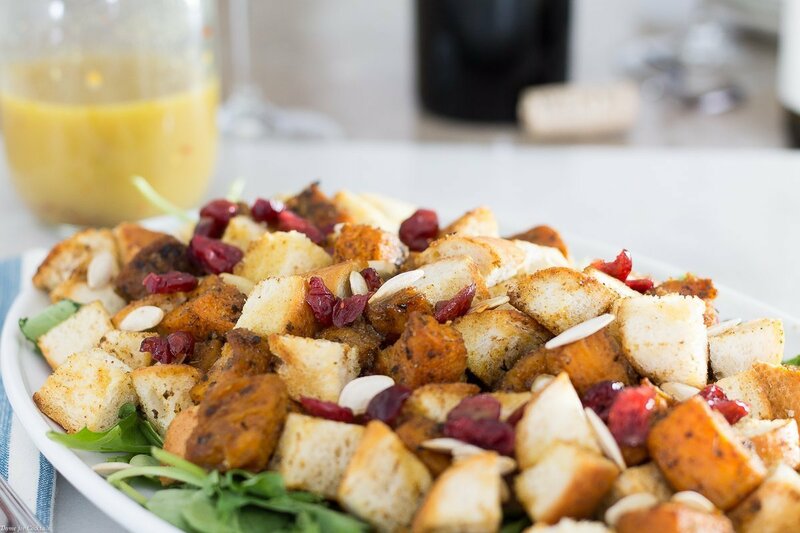 I hope you like this festive Chipotle Butternut Squash Panzanella Salad recipe as much as we do. If you love this family-style dish, you can find more like it by checking out my other seasonal recipes! For daily recipe inspiration, subscribe to my newsletter, follow me on Instagram, and for generally inappropriate humor follow like me on Facebook! Preheat oven to 250°F. Line a large baking sheet with parchment paper. Place bread cubes on tray, drizzle with 1/3 oil. Toss to combine. Salt and pepper lightly. Bake 8-12 minutes until lightly toasted. Remove bread from tray, place in a large bowl and set aside. Increase oven temperature to 425°F. Place squash on same baking tray. Drizzle with remaining oil. Mix spices together in a small bowl. Sprinkle over squash, toss to coat completely. Roast 20-25 minutes until tender. Set aside to cool slightly. Once cool add to bowl with bread cubes along with cranberries and seeds. 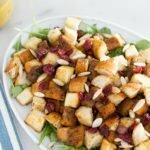 Drizzle with desired amount of vinaigrette. Toss to combine. Arrange arugula on a large serving platter. Spoon salad over greens. Garnish with fresh lemon wedges and server warm.